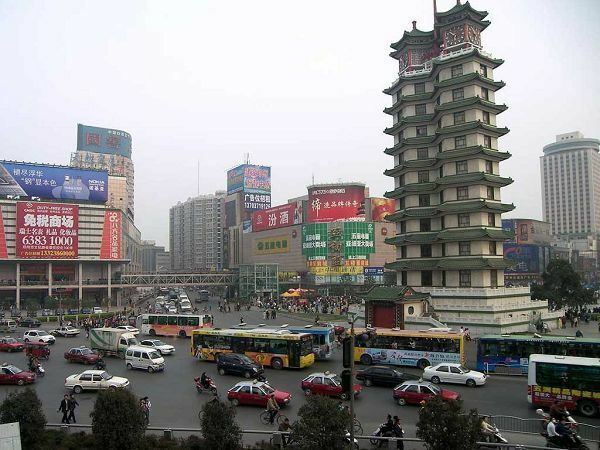 Zhengzhou is a Chinese city and the provincial capital of Henan Province in east-central China. As a prefecture-level city, it also serves as the political, economic, technological, and educational centre of the province, as well as a major transportation hub for Central China. The city lies on the southern bank of the Yellow River, and is one of the Eight Great Ancient Capitals of China. Zhengzhou has a population of 9,378,000 inhabitants with an urban population of 6,406,000, the city is one of the main built up areas of Henan region. Zhengzhou is now a rapidly growing city. Greater Zhengzhou was named as one of the 13 emerging megacities or megalopolises in China in a July 2012 report by the Economist Intelligence Unit. Zhengzhou is divided into 6 urban districts, 5 county-level cities and 1 county. These subdivisions are likely to undergo a significant change in the near future due to rapid urban expansion and urban planning. The municipality is home to 8,626,505 inhabitants (2010 census) and over four million in its built up area, making the city one of the main built-up areas of the province. The section of the Yellow River flowing through the prefecture extends 150.4 km (93.5 mi). Mountains loom over the western counties of Gongyi and Dengfeng while the easternmost county of Zhongmou is a vast, fertile floodplain, with the counties in between being hilly transitions. Zhengzhou experiences a monsoon-influenced, four-season humid subtropical climate (Köppen climate classification Cwa), with cool, dry winters and hot, humid summers. Spring and autumn are dry and somewhat abbreviated transition periods. The city has an annual mean temperature of 14.35 °C (57.8 °F), with the monthly 24-hour average temperature ranging from 0.1 °C (32.2 °F) in January to 27.0 °C (80.6 °F) in July. The frost-free period lasts on average 220 days. Extremes since 1951 have ranged from −17.9 °C (0 °F) on 2 January 1955, 27 December 1971 and 1 February 1990 to 43.0 °C (109 °F) on 19 July 1966. As air pollution in China is at an all-time high, several northern cities are among one of the most polluted cities and Zhengzhou has one of the worst air quality in China. Reporting on China's Airpocalypse has been accompanied by what seems like a monochromatic slideshow of the country's several cities smothered in thick smog. According to a survey made by "Global voices China" in February 2013, Zhengzhou is among China's 10 most polluted cities. Other cities on the blacklist includes major Chinese cities like Beijing, Jinan, Shijiazhuang, and 6 other prefectural cities all in Hebei Province. According to a report by Greenpeace in 2015, Henan (the province that Zhengzhou is in) has the most severe air pollution in among all the provinces in China with an average PM2.5 concentration of 103.3μg/m3. Ranking second and third respectively are provinces of Hubei and Hebei, with PM2.5 concentrations of 99.2μg/m3 and 98.4μg/m3. Zhengzhou is the fourth most polluted city air-wise in China, with PM2.5 concentration of 134.7μg/m3 (over 13 times the safe limit established by the WHO) during the first quarter of 2015. Other cities in Henan that ranked within the top 30 most polluted cities in China during the first quarter of 2015 include Xinxiang, Jiaozuo, Anyang, Pingdingshan, Zhoukou, Xuchang, Puyang, and Luoyang; all with PM2.5 concentrations above 100μg/m3. 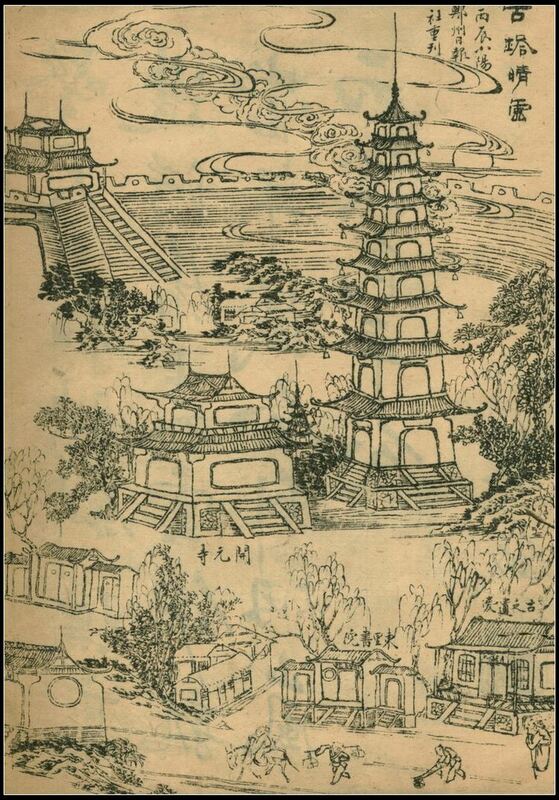 Zhengzhou was the national capital of China during the Shang dynasty. Parts of the Shang-era capital city wall that were built 3,600 years ago still remain in Downtown Zhengzhou (Shangcheng Road 商城路). Zhengzhou maintains abundant its cultural heritage that reflects its glorious history as well as the culture of Henan Province. Zhengzhou Confucius Temple, initially built during the Eastern Han dynasty 1900 years ago, is one of the oldest Confucian Temples in China; other important architectural heritage sites in the city include Town God Temple and Erqi Memorial Tower. 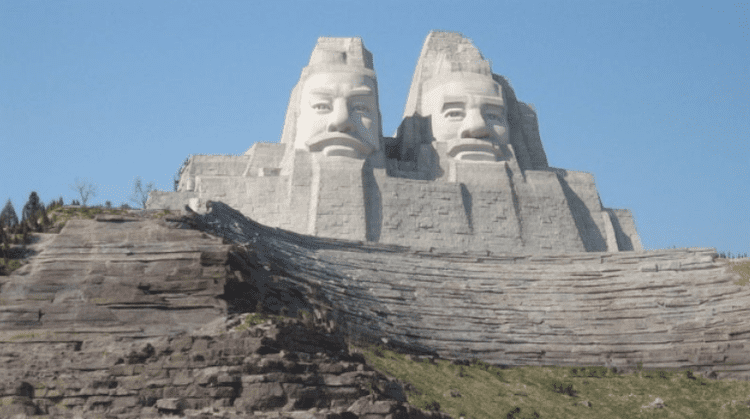 The internationally known tourist attraction is the Shaolin Temple, which is more than 50 miles (80 kilometres) southwest of downtown Zhengzhou (1.5 hours by coach). The Shaolin Temple is not only known as one of China's important Buddhist shrines, but also as the ancient center of Chinese Kung-fu. Shaolin Monastery and its famed Pagoda Forest were inscribed as a UNESCO World Heritage Site in 2010. The Henan Museum is one of China's most important museums which includes exhibits from prehistoric times, including dinosaur fossils, prehistoric human remains, up through the Modern Eras. Zhengzhou Zoo (郑州动物园) is located on Huayuan Road (花园路). The newly built Zhengzhou Botanic Garden is at the western edge of Zhengzhou city. the birthplace of Yellow Emperor, recognized as the ancestor of Chinese people. Zhengzhou, along with Xi'an, Chengdu, Chongqing and Wuhan, is one of the most important cities in inland China. It is the second largest city in central China, after Wuhan. It is the economic center of the province and the surrounding areas such as southeastern Shanxi and southwestern Shandong. Due to its strategic location in one of the most populous areas in the world (nearly 100 million people in Henan alone) and in China's railway, road and aviation transport networks, Zhengzhou is increasingly attracting domestic and international investment as well as migrants from other areas, transforming the city into one of the largest economic centers in China. In 2015, total GDP of Zhengzhou was ￥ 745 billion, ranked as 18th city in China; while the GDP per capita of Zhengzhou was ￥ 78003.73 (about US$12,500), ranked as 47th city in China. By the end of 2006, Zhengzhou had a total population of over 7 million, of which 2.88 million lived in rural areas. Its main products include apples, paulownia, tobacco, maize, cotton, and wheat. In addition, Zhengzhou also produces Yellow River carp, Zhengzhou watermelons, Xinzheng jujube, [Xingyang] dried persimmons, Guangwu Pomegranate and Zhongmu garlic, all of which are specialties that are rarely found outside the region. Foxconn Zhengzhou, located in Zhengzhou Airport Economy Zone， currently is the largest production site of smart phone in the world, also known as "iPhone City". Sanquan Food, frozen food company. With over 20000 employees,Sanquan produced the first frozen dumplings and rice balls in China. Henan Construction, a large real estate developer, which owns one of the China Super League's soccer clubs. The Zhengdong New Area, also known as Zhengzhou Eastern New District(郑东新区), similar to Hangzhou Bay New Area in Ningbo and Hengqin New Area in Zhuhai, is just one of dozens of major economic zones that are currently developing in various regions of China. 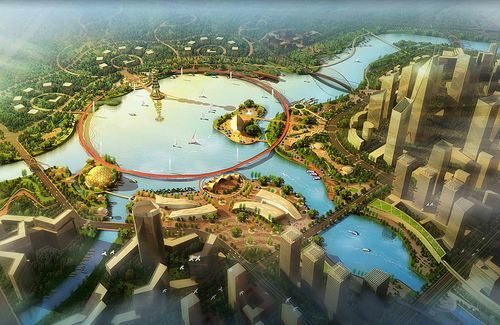 The provincial and municipal governments established and developed Zhengdong New Area, Mr. Kisho Kurokawa, a Japanese world-renowned planner and architect, was appointed to design the overall planning scheme for Zhengdong New Area. He brought in advanced ideas including ecological city, co-existing city, metabolic city and ring city ideas. The scheme won the "Prominent Award for City Planning Design" at the first session of Annual Meeting of the World Architects Alliance in 2002. The highest architecture in Zhengzhou is the 388-meter height Zhongyuan Tower. The highest building in Zhengzhou was the Quanxi Tower (known as the "Big Corn" for local people)in the middle of Zhengdong CBD, with the height of 280m. Currently the tallest buildings are the Greedland Group Central (Two Towers) in front of Zhengzhou East Railway station with the height of 300m. Zhengzhou, where the Longhai Railway (Lianyungang, Jiangsu–Lanzhou, Gansu) meets the Beijing–Guangzhou Railway, is a major national railway hub. It is located on the Shijiazhuang–Wuhan High-Speed Railway and Xuzhou–Lanzhou High-Speed Railway and is easy to reach by high-speed train from Beijing (2.5 hours) Hong Kong (7 hours) and Xi'an (2 hours) and Shanghai (4 hours). The high-speed railway network provides fast train service from the city to Beijing, Shanghai, Nanjing, Xi'an and Wuhan at a speed of 350 km/h (220 mph). The new high-speed Zhengzhou East Railway Station is one of the largest in Asia. Proposed high-speed railway connections between Zhengzhou and Chongqing, Jinan, Hefei, and Taiyuan are under discussion. 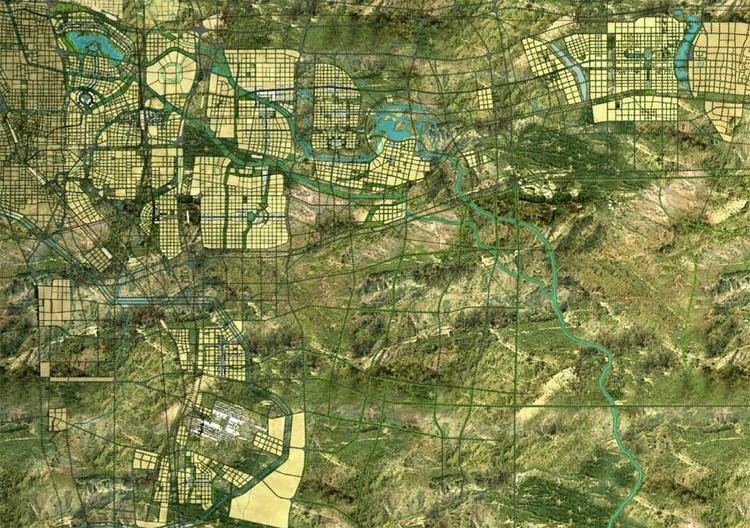 The surrounding area of Zhengzhou, along with the Yangtze River Delta, Pearl River Delta and the Bohai Economic Rim, has the highest highway density nationwide. Zhengzhou is the center of Henan highway network that provides roughly one hour road trip to the surrounding cities of Kaifeng, Xinxiang, Xuchang, Jiaozuo and Luoyang. Other major cities within the province can be reached in 3 hours. National highway network also links Zhengzhou to all major cities in the country. The first project of Zhengzhou BRT System was opened in 2009 and has 70.3 km of busway. It consists of a circle line (B1) along the Second Ring Road, another corridor on the north and west sections of the Third Ring Road (B3), and a third corridor under the Longhai Elevated (B5). Zhengzhou is the home to Yutong one of the largest bus and coach producers in Asia, because of this all the buses include the BRT system are manufactured by Yutong. The App "郑州公交查询" "郑州公交实时查询"on Apple store and the Andriod App "郑州行" could be used for schedule search. The Zhengzhou Metro currently has 3 lines creating a 93.7 km (58 mi) long network. The first 2 lines were approved by the National Development and Reform Commission in Feb. 2009. The two projects started in 2009 and finished in 2013 and 2015 respectively. As referenced in the long term plan, there are another 4 lines pending approval, Line 3 and Line 4 is under construction since 2015 and will be in operation by 2020 and the construction of Line 5 and Line 6 will begin in 2020. These lines will allow the rapid transit network to serve both the urban and suburban districts of Zhengzhou. Zhengzhou Xinzheng International Airport (IATA: CGO, ICAO: ZHCC) is 37 km (23 mi) southeast of the city centre. The airport was the headquarters for Henan Airlines and also a focus city of China Southern Airlines and Shenzhen Airlines. The throughput of Xinzheng International Airport in 2016 is over 20 million people. It is also one of the eight air hubs nominated by the Civil Aviation Administration of China. Air Asia and Everbright Group will be using the airport as their China LCC hub along with a brand new LCC terminal, an aviation training hub and MRO facilities to complement the expected growth . Bai Juyi 白居易 (772–846), Tang dynasty poet widely known for his poems featuring realism. Deng Yaping 邓亚萍 (1973– ), a four-time table tennis Olympic champion who later became a businesswoman. Du Fu 杜甫 (712–770), Tang dynasty poet, born in Gongyi, now a county under the administration of Zhengzhou. Wei Wei 魏巍 (1920–2008), modern era writer, widely known in China for his works on the Chinese Volunteer army's participation of the Korean War. Hai Xia 海霞 (born 1972), Chinese news anchor for China Central Television, the main state announcer of China. Han Fei 韩非(ca. 280 BCE - 233 BCE), also known as Han Feizi, an influential political philosopher of the Warring States Period.